I shared this on Facebook and Instagram last week but wanted to share here also. After work today I had to go to the grocery store to pick up some cheese i had forgotten for dinner. I was rushing through the store because I was so ready to get home out of the cold, into some pjs. I got in the express line and a little old lady was in front of me. She was hunched over and moving ever so slowly chatting to the cashier. I kind of sighed because I always seem to get in a slow line, even if it's the express line, but as I stood there, I saw myself as that little lady. Sooner than I think I will be that little old lady, and I would hope a younger person would have patience with me. As she paid for her groceries she asked the cashier if someone could help her load her groceries in the car. The cashier said she would help and shut her light off. She finished my items since she had already started and asked the person behind me if they would mind going to another line. That person caught an attitude and got loud. I told the cashier not to worry about it, I would help her. So off we went, very slowly to her car. She chatted the whole way. Once I loaded the groceries she thanked me. 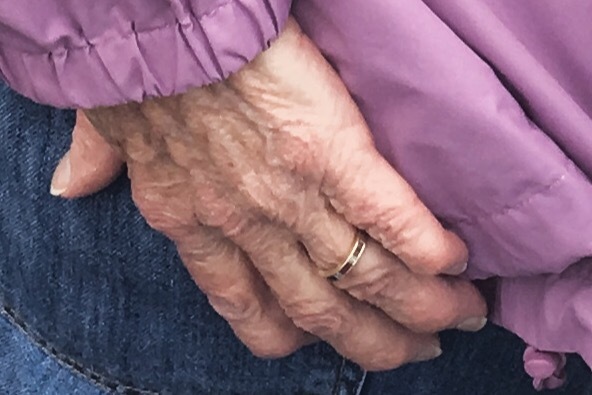 I took her wrinkled hand, gave it a squeeze, and told her she was a blessing to me and reminded me to be patient and slow down. That one day, I too will be older and slower and I hope people will be patient with me also. She squeezed my hand back, gave me a smile, got in her car and drove off. I hope someone was home to help her bring her groceries in. The Birth of Samantha Isaida - my namesake!